Crude prices are $47.45/bbl this morning, soaring higher yesterday following the EIA’s report of across-the-board stock draws (more below). 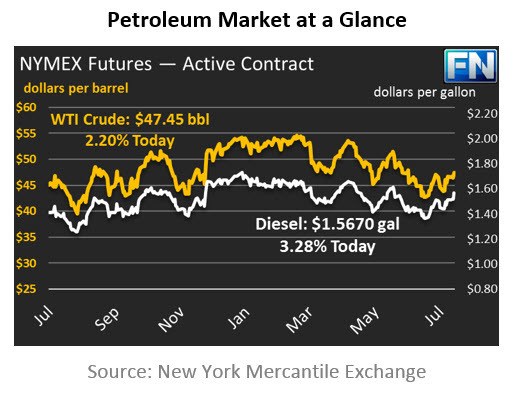 Prices reached a high yesterday of $47.60, closing the day at $47.12. Prices opened this morning at $47.09/bbl, and have been rising this morning. Today’s opening price was the highest since early June. Diesel and gasoline prices are both tracking higher in response to stock draws. Diesel prices are currently $1.5670, while gasoline prices are $1.6263, gains of 1.01% and .58%, respectively. While crude prices are the highest they’ve been since June, refined products both saw gains high enough to push prices to their highest level since late May. Yesterday’s EIA stock report yielded solid support for prices, with draws significantly larger than market expectations, although slightly lower for refined products than the API forecast. Crude inventories are now within 1.8 MMbbls within their 2016 levels, though still 125 MMbbls above their 2012-2015 average. Gasoline inventories, which tracked 2016 levels for most of the year, are now almost 10 MMbbls below last year’s level, assisted by another year of high summer demand (though slightly lower than last year’s demand). Diesel demand has increased, helping inventories continue lower. With inventories dropping so quickly, one particularly interesting theory published by Reuters yesterday is that Saudi Arabia has been cutting exports to the U.S. in order to deplete the most visible inventory stocks. The U.S. makes up over 40% of OECD crude and product stocks, and publishes inventory movements weekly, making it one of the most widely used stand-ins for global inventories. 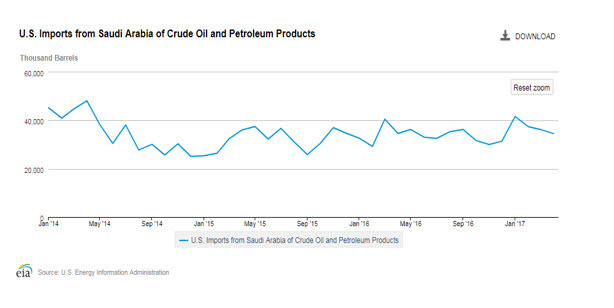 By forcing the U.S. to draw down inventories more quickly, Saudi Arabia can give a quicker boost to global prices. This theory seems incongruous with the EIA data, however, which shows that exports have been in line with (or even a bit higher than) historical prices. So far this year, data is only available through April – as more data becomes available, markets will be able to see whether the theory has merit.